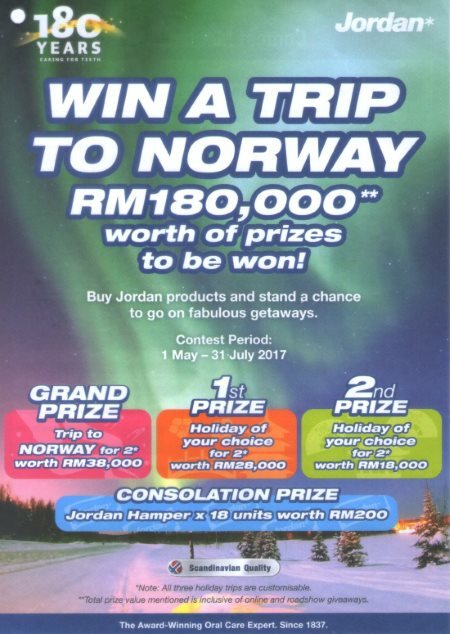 Home » hampers » lucky » lucky draw » purchase » spend » travel contest » WhatsApp » Jordan 180th Anniversary Contest: Win a trip to Norway! Jordan 180th Anniversary Contest: Win a trip to Norway! Purchase any Jordan product at participating retailers (online or offline) and keep the receipt. Participation Online: Visit Contest Site, fill in your details and attach a picture of the receipt as proof of purchase. Participation via WhatsApp: Fill in the Contest Form, snap a picture of the form and WhatsApp to 018-2028262, attached with a picture of the receipt as proof of purchase. Answer a simple question and stand a chance to win amazing holiday prizes! Visit Jordan 180th Anniversary contest page for more details.